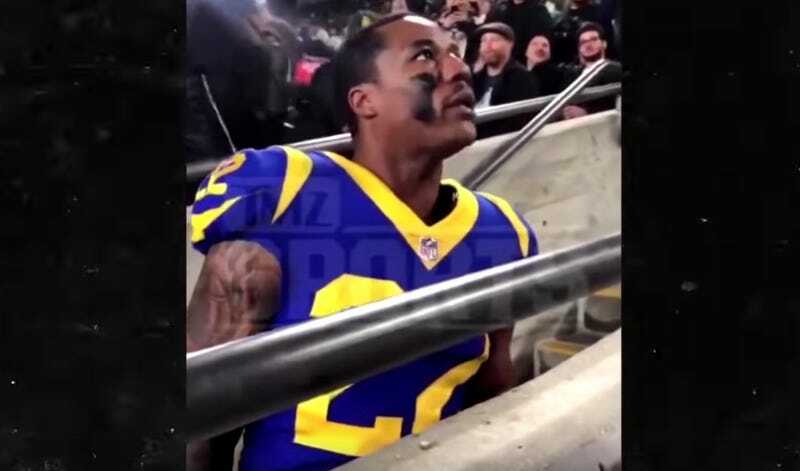 During the Rams’ loss to the Eagles last night, a heckler behind the Rams bench kept pestering cornerback Marcus Peters. Instead of chilling on the bench and ignoring him, Peters walked over and confronted the heckler, repeatedly asking him where he was from. TMZ Sports obtained a slightly longer video showing both security guards and Rams safety John Johnson III pulling Peters back to the bench. Rams coach Sean McVay is expected to address Peters’s confrontation later today. Oddly, former Saturday Night Live actor Taran Killam saw it all go down and has somewhat of an inside scoop. It has really not been a good 24 hours for the Rams. Update (3:01 p.m. ET): Peters addressed the incident this afternoon.